Amazon CEO Jeff Bezos Funded An Expedition To Find What? The Costume Design Of The Ewoks In The Star Wars Universe Was Based On? Millions of people were inspired by the Apollo Program. I was five years old when I watched Apollo 11 unfold on television, and without any doubt it was a big contributor to my passions for science, engineering, and exploration. 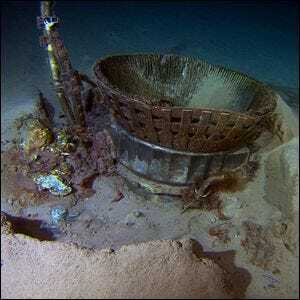 A year or so ago, I started to wonder, with the right team of undersea pros, could we find and potentially recover the F-1 engines that started mankind’s mission to the moon? Today, I’m thrilled to share some exciting news. One of the conservators who was scanning the objects with a black light and a special lens filter has made a breakthrough discovery – “2044” – stenciled in black paint on the side of one of the massive thrust chambers. 2044 is the Rocketdyne serial number that correlates to NASA number 6044, which is the serial number for F-1 Engine #5 from Apollo 11. After restoration, the engines are on permanent display: one at the Smithsonian Institution’s National Air and Space Museum, the other one at Seattle’s Museum of Flight.